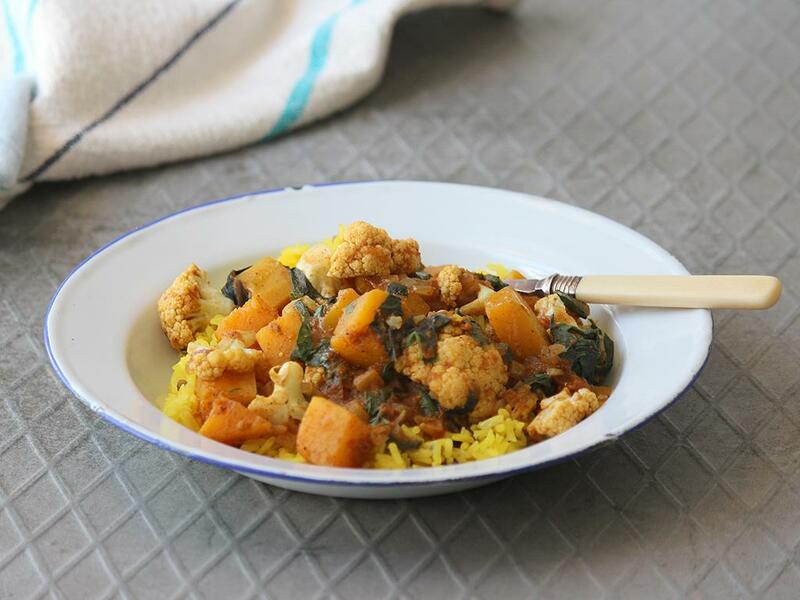 A warm, coconut & masala infused curry with butternut, cauliflower & Swiss chard. Fragrant curry: Place a large pan on medium-high heat with a drizzle of olive oil. Add the onion with a pinch of salt and cook for 5 minutes before adding the garlic, grated tomato (with the liquid) and Mother-in-law Curry Powder (spicy, so use to preference). Sauté for 3 minutes, then add the butternut and pour in the coconut milk with water, just enough to cover the butternut (½ cup for 4; ¼ cup for 2). Cover with a lid and let it simmer (gently boil) for 5-8 minutes until the butternut starts to soften. Add the cauliflower and simmer (without covering) for another 4-5 minutes until the cauliflower is cooked. Add the garam masala with the Swiss chard and cook for 1 minute until wilted. "Was it easy to prepare? Yes Was there enough food? Ample. Were the instructions easy to follow? Yes. Somehow my least favourite dish of the week and I thought it would be my best one. The butternut takes so long to get soft, I even let it go for another 5 minutes, it seemed like runny stir fry instead of soft creamy curry. I didn't hate it, definitely going to smash the leftovers tomorrow, I just didn't love it as much as the other ones. :)"